We took the kids to the zoo on Saturday. It is one of the gems of the St. Louis area. 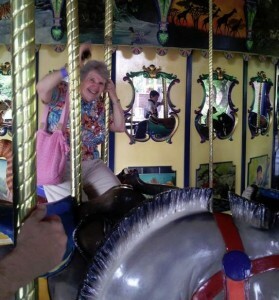 As I was there, it occurred to me that a Merry-Go-Round is a good way to describe the legislative session. Bad bills continue to be reintroduced. Good bills continue to spin around in orbit. Some are so absorbed in the music and waving to the spectators that they hardly notice that another year has passed. Usually, very little is accomplished because government is inclined to be inefficient. However, this year was the first time in Missouri the Republicans had a Super-Majority in both the House and the Senate. That means a veto-proof number of legislators should be able to accomplish whatever the leadership directs to happen. Yet, even with a super majority of legislators, the Governor has vetoed a large number of bills. Ultimately, the real question is whether government grew bigger, or was limited. The purpose of government is to protect the innocent and to punish the evildoers. The vast majority of the bills are outside of the scope for which government was created. Tonight we have a show with Kurt Bahr, the State Representative to whom I passed the torch in the Missouri House of Representatives. He makes himself available to answer our questions about what has been accomplished this year in the Missouri State Legislature and if we can expect any veto overrides. At the close of session, the House members have a tradition of throwing their papers everywhere. One question I have is why the legislators are still throwing paper around when we were transitioning to reading bills on our computers when I was there. Perhaps Kurt Bahr can tell us how all this excessive paper got into the chamber. Home Font is a weekly pod-cast by Cynthia Davis. As a writer, speaker and former legislator, Cynthia discusses limiting government, fiscal responsibility and fair taxation. Cynthia is a mother of seven and a wife of one for over three decades who brings her personal experience to the conversation. Are there shenanigans in the State? Join us for a fascinating discussion of the inner-workings of the 2013 legislative session with Missouri State Representative Kurt Bahr. This was the first year Missouri had a session with a Super-majority of Republicans in both the House and Senate. Rep. Bahr will offer some analysis and thoughts on what to expect for the upcoming veto session. – You’re not being sent to the principal’s office. You’re “going on a mandatory field trip to the administrative building.